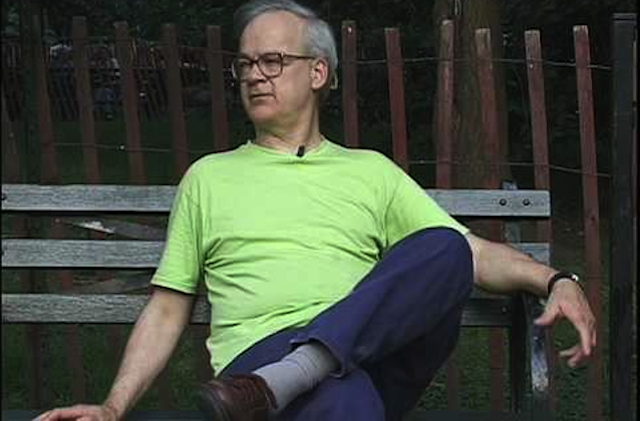 Tony Conrad was an underground artist, in almost a Forrest Gump-like way. He studied math at Harvard in the early 1960s, and was one of the wave of bohemians that took advantage of the crumbling infrastructure of pre-Disneyland New York City, forging art from the ruins of civilization. His contributions to music – he took the tone of a violin to new levels of sonic revelations – and film are still being felt to today, he was one of those prototypical ahead-of-his-time artists. He influenced elements of The Velvet Underground, Andy Warhol, German rock and counterculture film, with an understated presence that was about the work, not the praise. Director Tyler Hubby has created an essential portrait of Conrad in his new documentary, and triumphantly premiered it at the Chicago Underground Film Festival. HollywoodChicago.com was at the Opening Night of CUFF, and sat down to talk to director Tyler Hubby about the fascinating cultural agitator Tony Conrad. HollywoodChicago.com: Tony Conrad just passed away in April of this year, what particular gratitude do you have, in the sense that you got to know him and collaborate with him? When I began to make the documentary in earnest, I felt like I was on a bit of probation. He checked me out and made sure I was going to do the right thing…and I passed that scrutiny. He relaxed when he realized the process really was going to fun, as much as anything else. HollywoodChicago.com: Tony was plying his filmmaker tone during the 1960s, a very experimental era. In studying all that, what do you think they had that we lack as artists today? Hubby: In looking back, I was struck by the ‘newness’ of it at the time. [Points to a electronic media screen in the room] Fifty years ago, those video waves would have been completely radical. Now it’s a screensaver. The essential idea of him goes back to ‘Flicker’ [Conrad’s experimental film that was a series of flickering black and white screens], where he made a film with no content, it was such a radical notion…and still can influence if it’s shown in the right venue. Hubby: One of the things that emerged for me, as I was putting the film together, and looking for that through line that would define his work, was how he was a political artist, and how ‘Flicker’ is a political film. It was that radical, showing cinema not as a corporate entity that painted images on the screen for you, but allowed that people would make their own movie in their own mind. It was very self-empowering for the viewer. Even in his music, it was a very active and engaged experience for the audience. HollywoodChicago.com: I was fascinated by your use of archival film and photographs. What was the rarest piece you unearthed, and what was the circumstance of finding it? Hubby: The great ‘get’ in the research was finding a forgotten archive of photographs by the Frederick Eberstadt. He was an upper East Side psychotherapist, and his wife was a big art collector. They would go downtown and hang out with those crazy bohemians. Fred did a photographic series on Tony for ‘Look’ magazine. Tony had several prints of these photos, but it was only about a few dozen, and there were 90 contact sheets [mini-prints of all the rolls of film processed] at the Library of Congress, all from 1966. We had initially seen only 15 frames from 90 rolls of film. His wedding picture were in there and so was photos of colleagues that no one had ever seen before. It was an amazing find. HollywoodChicago.com: What about Tony’s archives? Hubby: I would make requests, and he would write me back saying, ‘this is outrageous!’ And then two months later I would receive a thumb drive in the mail with astounding artistic examples and images. We actually had an Associate Producer who came on board, and would go to Tony’s house to guide him through the process of looking through things. We’d set up the scanning, and take care of it for him. HollywoodChicago.com: La Monte Young was an early music collaborator with Tony, and later would not release some historic recordings that he did with him [unless Conrad signed away the rights, which he refused to do]. Since he sort of overshadowed the story with this odd circumstance, are those tapes still under lock and key? Hubby: I can’t comment on La Monte, and I included in the story only through Tony’s perspective – all I really know is what Tony talked about. The point is that it was a very upsetting experience for Tony, and nobody really knows what La Monte’s motives are for doing this. They simply have a fundamental difference in the conception of what this work was, and neither budged. HollywoodChicago.com: What did you learn about yourself as an artist, in the process of profiling Tony Conrad? Hubby: It’s a tricky thing. As I was editing the film, my thought was ‘where do I show my hand?’ versus ‘where do I bring Tony’s work to the forefront?’ I was doing a portrait of another artist, who has a very distinct aesthetic. I want that in the foreground, but at the same time I have certain aesthetics that I want to express as a filmmaker. In a way, it was trying to find a dialogue between these two aesthetics, and it all came through the editing process. Tony runs the show, as soon as the camera is on. You don’t want to stop him and say, ‘go back and redo that.’ [laughs] It was just about keeping it rolling. It moved around a lot in the edit, as we were looking for the elusive through line to his life. It was also about finding that balance between theme and chronology. One thing led to another, and we found the causal relationships and themes. It was all trial and error. Ultimately, it was his attitude toward perceived forms which informed me. It was about looking around the corner of what was there, there is always something going on underneath the surface. In a way, even though I never studied with him formally, I was his student. HollywoodChicago.com: When the student is ready, the master appears. Closing Night for the 23rd annual Chicago Underground Film Festival is Sunday, June 5th, 2016. All films are at the Logan Theatre, 2646 North Milwaukee Avenue, Chicago – with an after party to follow. For information regarding the festival and Closing Night after party (click on 2016 Parties and Special Events) click here.